There's a special memory I have when I was little of me and my mom. I was in elementary school, and I got all A's on one of my report cards. So my mom said she would take me to Toys R Us to get a My Little Pony. I can remember picking a pony at the store and afterwards going to McDonald's to celebrate. I got a McNugget Happy Meal and my new pony got to sit at the table with us. I can picture the exact booth we sat in at that McDonald's back home. It's one of my absolute favorite memories. I had a lot of wonderful toys when I was little. And I love it when a special toy sneaks into my head so I can think of all the times I spent playing with it. 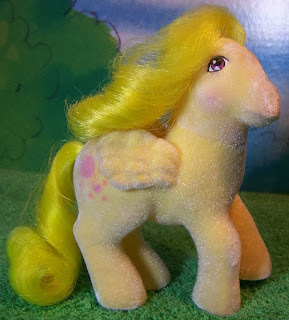 Mostly, my Ponies weren't "played" with but rather had their hair brushed constantly. I *loved* brushing their manes and tails. Here is a pic of the pony I got in my memory when we went to McDonald's. Her name is Lofty! This was another pony I loved. I played with her so much her cutie mark wore off. Her name is Sunnybunch. Do you have a favorite childhood toy? I loved this post. 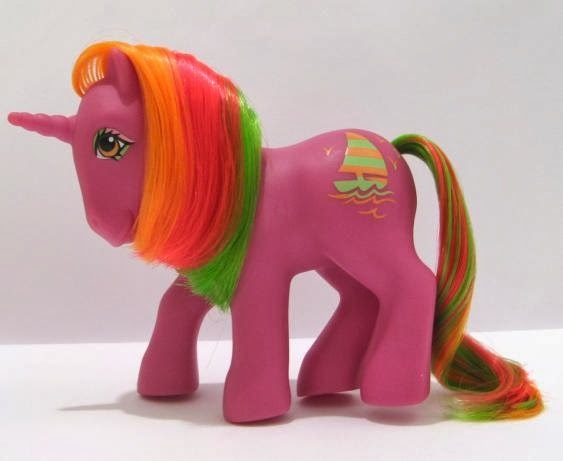 I was obsessed with MLP. I love the board game soo very much. My fave childhood toy were my SheRa action figures. I still have a Rainbow Dash doll in my room :D Awesome blog by the way, I'm following you now!